Buy a sun glasses ... It is not a simple task and it is that each one has different features, a face cut of their own, a style and of course, a very particular taste. How many times has it happened to us that we tried a sun glasses and everyone looks fantastic but in reality we do not like anything or on the contrary, that from the outside it looks a bit regular but we love it. This is the most common in the world and therefore, to try a sun glasses and see how we will stay is essential for us to make a safe purchase and then enjoy it. Since the online world turned around and became a real boom, we all bought online quickly, agilely and safely. Now nobody (or almost anyone) has doubts that what is purchased online is going to arrive well, which will be what we have requested, that we also have the ability and opportunity, if we do not like it, to return it for another item ... Buy Now online is really, a major advantage for the comfort it brings. At the click of a button and without moving from our chair - sofa, we can buy everything we want (be located in the part of the world that is) and arrive directly in a few days at the address we want. Is there something easier? Yes! You can also, virtually, see how you're going to be what you're going to buy and go on insurance. And in Root Sunglasses this is now more than possible. On our website you have a virtual tester with which you can, in real time, try all the glasses of our eshop and see if they will look good on your face, with your hair and with your features. In this way you can make your model selection in a much more refined way and with the peace of mind that you have been able to have a first impression of how the result will be when you have it in your power. How does RootSunglasses' virtual eyewear tester work? 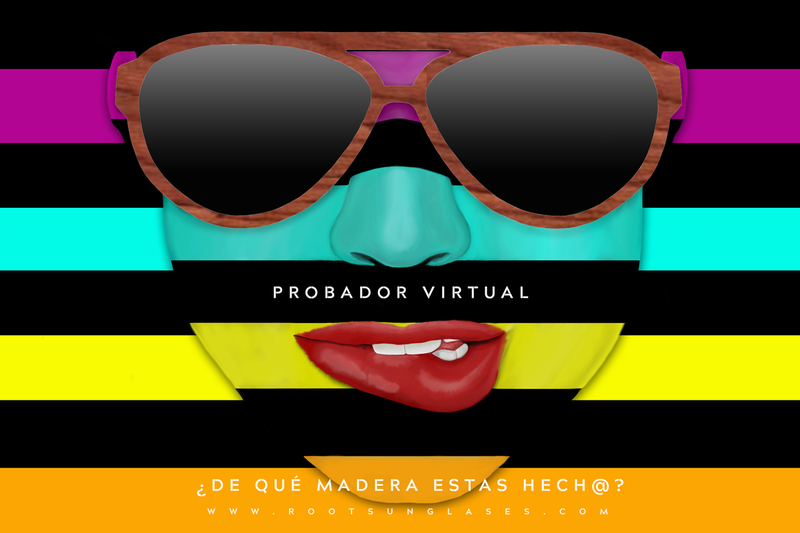 First of all we must start by saying that using the Root virtual tester is very easy and in a few steps you will know how you would have the sun glasses you have chosen. 1.- Choose a model that you like in our eshop. Inside our online store, look at all available models, choose the one you like you can click on the glasses to access the product file and you can also access the tester directly from the list of glasses. 2.- If you open a goggle once you are inside the goggle in question, in the panel on the right you will find an icon that simulates a goggle and on which to pose, the legend of "virtual tester" will appear. 3.- Just click, you will see a popup window that you can configure in such a way that you will see the final result of your glasses on the image that you choose. - Browse: click and you can access any image of your computer to upload it and on which to test the chosen glasses. - Webcam: if you do not have any photos on your computer that you like and prefer to do it in real time, the virtual tester tool will access your webcam to make a snapshot at the moment. 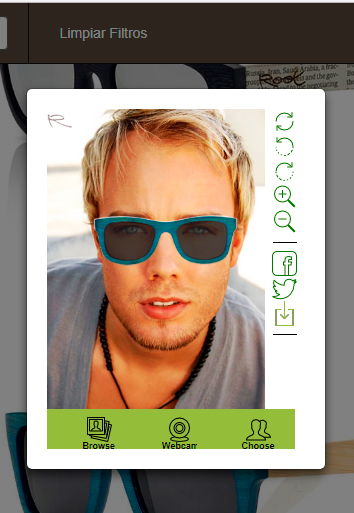 - Choose: and finally, you can choose some of the photos that are loaded in the tester to see the different types of features. This option is very good if you are giving a spectacle and you do not have a photo of the person in question. You can make yourself a very good idea. Once you have chosen your photograph, you have captured one in real time or you have chosen one from the gallery, you can do many things like rotate the image, zoom in to see in detail or zoom out to get a global idea of ? ?the result ... And also share it in your favorite social networks or even, save the image on your device. If you are going to perform the test from your mobile it is also super agile and you just have to follow the steps as before. From anywhere you can try on the glasses and see how they would look. After that, it will only be necessary to make the purchase and in a few days, you will have them wherever you tell us. And you, have you already tried your glasses for next spring?